At Lakeside Feed, we deliver! 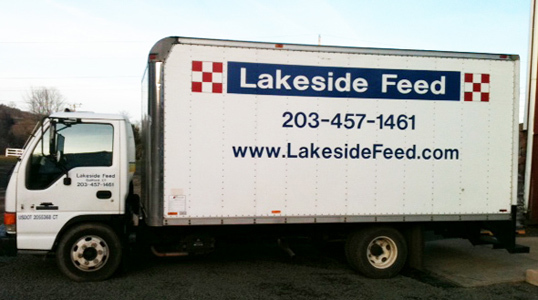 Lakeside Feed has a full-time, on-site truck that offers dependable delivery six days a week, Tuesday to Sunday, typically within 24 hours of an order. Our fees are minimal, starting at $5.00. We deliver from Deep River to North Haven, and the surrounding areas. Will Schiano is our delivery driver of three years. Will takes pride in his job and is very thoughtful whenever he delivers to local farms. You don't have to worry, he always remembers to shut gates and close doors which is an essential part of the service. Here at Lakeside we are always accepting new delivery customers. Please contact us at 203-457-1461 or email us at lakesidefeed@comcast.net for more information or to set up your next delivery.